The use of domain-specific languages (DSLs) is a promising approach to helping programmers write an efficient program for high-performance computing. The programmers would feel difficulties in writing such a program by hand with only low-level abstractions, such as arrays and loops, provided by a general-purpose language. This chapter presents our new implementation technique for domain-specific languages. Since existing techniques are not satisfactory, we developed our technique called deep reification. 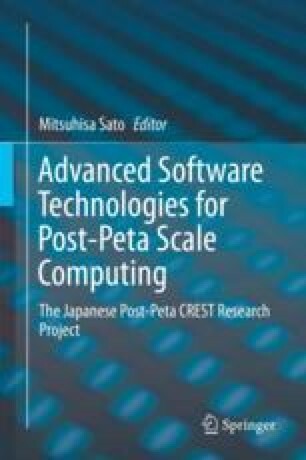 This chapter also presents Bytespresso, which is our prototype system to use deep reification. Several Java-embedded DSLs implemented with Bytespresso are presented to assess the effectiveness of deep reification and Bytespresso. Program fragments written in these DSLs are embedded in Java, but they are dynamically off-loaded to native hardware to obtain good execution performance. Since they are embedded in Java, the syntax of Java is reused by those DSLs, and hence the development costs of these DSLs are reduced. I would like to thank Maximilian Scherr and Toshiyuki Takahashi for their various contributions to this work. This is partly supported by JST/DFG SPPEXA ExaStencil project. We deeply thank Christian Lengauer, Sebastian Kuckuk, Christian Schmitt, Matthias Bolten, Frank Hannig, and Harald Köstler. We also thank Shuichi Chiba at Fujitsu Ltd. for the experiment on FX10.